What is the cross-price elasticity of demand? How to calculate cross-price elasticity? This cross-price elasticity calculator helps you to determine the correlation between the price of one product and the quantity sold of a different product. Thanks to this tool, you will be able to immediately tell whether two products are substitute goods, complementary goods, or maybe entirely uncorrelated products. In this article, we will provide you with a cross-price elasticity formula and show you an example of step-by-step calculations. Once you have learned how to calculate the cross price elasticity of demand, we recommend taking a look at the optimal price calculator. 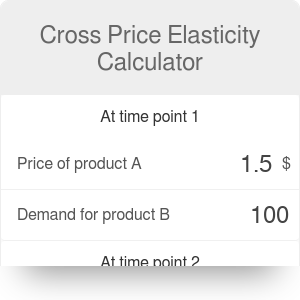 As mentioned before, the cross-price elasticity measures how the demand for a product (let's call it product B) changes if we change the price of product A. At first glance, the concept sounds a bit complicated, but we'll clarify it with a simple example. Imagine that you are the owner of a company that produces both coffee capsule machines and coffee capsules. Until now, the coffee machine was sold at a price of $120. You decide to drastically decrease the price to $80. Now, let's analyze what will happen with the demand for coffee capsules. As you could expect, the drop in price will cause an increase in the quantity of sold machines. More customers will need your coffee capsules, so the demand for them will increase, too! This concept is similar to the price elasticity of demand - make sure to check it out, too! ΔquantityB is the change in demand for product B. You can get one of three results: a cross-price elasticity coefficient that is positive, negative, or equal to zero. A positive elasticity is characteristic for substitute goods. It means that as the price of product A increases, the demand for product B increases, too. For example, this can be true for butter and margarine; once the price of butter goes up, more people opt for margarine, increasing the demand. This phenomenon is especially visible for situations in which only two competitors try to monopolize the market. A negative elasticity is characteristic for complementary goods. When the price of product A increases, the demand for product B goes down. A good example would be the coffee machine and capsules situation described earlier: if you increased the price of the coffee machine, fewer people would be inclined to buy the capsules, hence decreasing the demand. If the elasticity is equal or very close to zero, it means that the two products are uncorrelated. The change of price of product A does not influence the demand for product B. If you're still not sure if you understand how the cross-price elasticity works, take a look at the example below. Choose your product A and its initial price. Let's say that the product is Coca-Cola, sold at $0.69 per can. Choose the product B and the initial quantity sold. We can take Pepsi as product B - they sell 680 million cans per day in America only. In this step, choose the final price of product B. Let's say that Coca-Cola decided to decrease the price to $0.59. Observe how the demand for Pepsi cans changed. Let's assume it decreased to 600 million cans. The elasticity is equal to 0.8. It is a positive value, what means that Coca-Cola and Pepsi are substitute goods. Cross Price Elasticity Calculator can be embedded on your website to enrich the content you wrote and make it easier for your visitors to understand your message.